It was around this time last year that we worked with this couple to capture a beautiful wedding day in their city, Washington DC. This would be a fun shoot with some interesting and under-utilized features of the city, then a cozy and intimate reception to carry us on into the evening. We began the day at Hotel Monaco where the bridal party was getting ready on different floors. Felipe spent his time with Tom, and the groomsmen, while William captured a little behind the scene’s with Colleen as she put some finishing touches on her hair and makeup. With the bridal party ready, we put Tom in place and lead Colleen out for a first look ceremony under an archway just outside the hotel. From there, we made our way over to the National Portraits Gallery for… well, some portraits. Having already visited the museum a couple months earlier for their engagement session, we had a good idea of where we wanted to go, and what the lighting conditions would be like. If you didn’t know, the National Portraits Gallery is super friendly to artists. Of course, they don’t want you doing anything that gets in the way of other people enjoying the exhibits, and you can’t set anything up on stands (like lights, eek), but they provide very few restrictions beyond that. In fact, on more than one occasion, a security guard actually blocked a door or a passage way for a moment to let us get a shot. So, the lighting conditions aren’t ideal, but they’re workable and the location is definitely remarkable. After the gallery, we headed to the nearby Loft at 600F, which just so happens to be about a block and a half away. In our absence, the catering and venue staff had arranged everything for the ceremony beautifully, with big window light against an exposed brick wall. In practically no time at all, Colleen and Tom walked up the aisle, and then shortly there after, walked back down as husband and wife. Following the ceremony, we shuffled floors for the cocktail hour and reception. As the night went on, some lights were set on stands to help bring a bit of dimension into the images, while the glowing city lights in the background maintained a cozy charm. This wedding day was an absolute blast, and the pairing of the National Portrait Gallery with the Loft at 600F made for a convenient and seamless transition between the different parts of the day. We’d be there again in a heartbeat if we could. 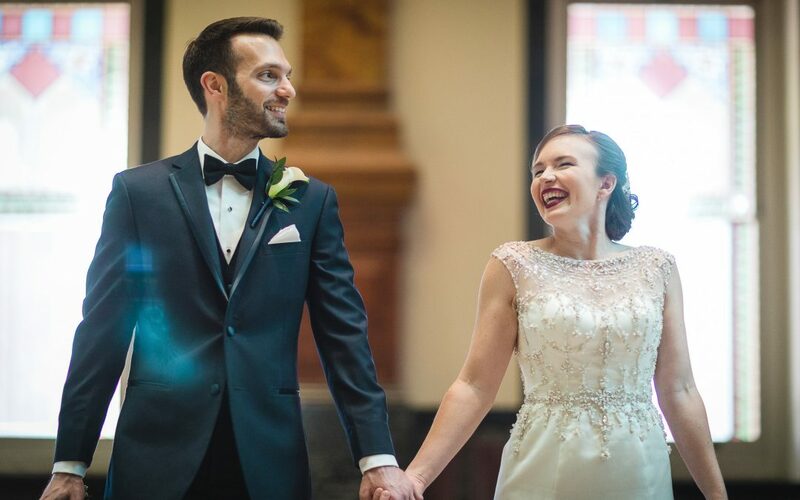 Check out some of our favorite shots from the day below, and if you’re looking for a wedding photographer in or around DC, be sure to check out the Wedding Photography page here on our website!